When my DH was off work on vacation last week he played with the children so I could sew some. 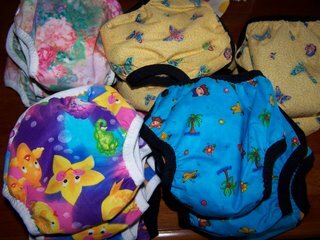 I made up 18 new training pants/diapers for my DD. I spent NO money but I did already have all this material. I am running very low on thread (I had to take the thread out of my serger to use my sewing machine. I think my projects will have to be more and more creative (thrifty) as the weeks go on. March is still a long way off. 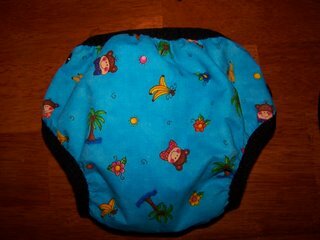 The pattern I used was from http://www.thenappynetwork.org.nz/diy.php I used the Wee Weka M-L Side Snap Nappy. I just printed out the pattern and traced it on 1 layer pul and 1 layer Alova then I used FOE to go around the outside. I let the Alova slip out of the FOE in the front to make a very quick pocket. I did not read the pattern. It might even give suggestions to alter it the way I am looking for BUT when DH says I will play with the children you can sew..... I RUN LIKE THE WIND! I grabbed a handful of my PUL and ALOVA and started sewing ASAP! I didn't want to waste any sewing time. Most of the time I don't like using patterns because I never have the time to read them and they never turn out the way I want. This pattern "FITS" my DD. I do think that they will work well. but I will give a try at making up my own pattern next time. My DD is 17 months old and about 19 pounds. We can slip the trainers on and off without snapping but they are very loose. They don't seem to be so loose that they leak (we even used one at night last night). I would feel better if I added another snap because of how thin my DD is. I think when I make up a pattern for my DD I would make one with a little wider (tiny bit) in the crotch. My diapers are not stretchy so stuffing them takes a little longer. I would make a under belly cut and make the tummy area not as wide. I would make shorter sides. 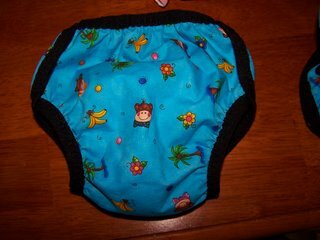 SO what I think would be better for my DD would be to take the diaper pattern I already made and turn it into a side snap. I have plenty of diapers right now so I don't know when I will get around to giving this a try..... Maybe not until after the holidays. I need to try to get my DD down for a nap so I can give a try at making a simple Pilgrim and Indian costumes for my children..... If I get them done today I will post them. OH! first a close up picture front and back of the trainers! (Don't look to close at the stitching I am still just a beginner with sewing). Look at the wonderful gift I got!